Threshold value you must reach at the minimum. A 5+ means 5 or more. Normally used on a D6 roll. At the start of a turn you generate campaingn points which represent a kind of action points enabling you to complete certain actions during a turn. Although you may have several action points, you are only allowed to spend one point at a time. So while one army is tearing down the defensive value of a city the enemy might arrive before you have accomplished your goal. The value positioned on a terrain location shows the defense value the territory provides. The values range from minimum 0 to maximum 4, depending on the territory. If no enemy is present the territory can only be captured if you tear down the difficulty value to 0 by expending 1 CP to lower the defensive value by 1 point. There are several different types of territory, only one army may occupy one terrain unless stated otherwise. Capturing one gives you certain advantages as listed on the territory desription. Not all territories might be present in your campaign. The value positioned on a road shows the difficulty for armies to march from one location to the next. The values range from minimum 2 to maximum 5. After you have spent your CP roll a D6 to see if you can move your army to the destination. If you fail, your army does not move and the CP spent is forfeit. Moving the army does not consume a CP, this does NOT relace the MD roll. You can immediately decide to use your CP on something else. Rebuilding the army does not consume a CP. You can immediately decide to use your CP on something else. During the setup you first determin the order of play. Then each player places one army on a territory on the map in the designated order. There must be at least one territory between enemy armies. If every player has placed his first army the order is reversed and now starting with the last player places a second army on the map. Again there must be minimum one territory. When all players have placed two armies on the map, the game can begin. Follow the steps described under A Turn. A game turn comprises of different phases as described above. A special case is 3) Spend CP's which is done one by one until all CP's are spend of give up. When a whole turn completes you start with a new turn. Players should decide beforehand of the victory conditions. 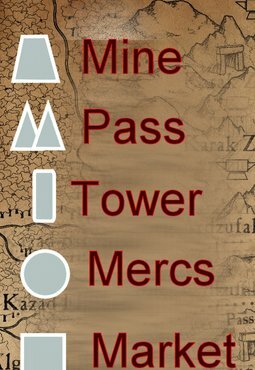 Possible conditions could be: Player with most terriotries after Y turns, Player with most battles won after X turns, First Player who captures 50% of the territories etc. Draw Game Pieces from the Order Stack and place them into the corresponding order slots. Use the context menu to place them back into the Order Stack. The Game Pieces drawn from the stack are in a randomized order. Drawing pieces will create a new random order each time. The order stays the same for the whole turn, in each phase.On the next turn a new order is determined. In order of play start generating CP's by rolling a D3+1. (You can use the D6 button and half the value, round down to nearest whole value). In order of play each player spends 1 (ONE) CP for one of the following actions. The player must log the usage in the message log and then decrease his CP value accordingly. If all players spent 1 CP you start the Spend CP's Phase anew, until all CP's are spent or removed. If a player does not posses any CP'S anymore skip him to the next player. Please note that certain actions require more than one CP to be completed. This can lead to a situation where your enemy will react to your actions, so keep this in mind, you always only spend ONE CP (unless you aqcuire a free action as seen on certain territories below). As long as you have broken or defeated armies you must spend your CP's first to rebuild these armies. You are not allowed to choose different actions until all your armies are rebuild. Make a notice in the message panel stating: action, action target (territory or road or enemy). Reduce your CP Points Value. Listed are the possible actions with the action name, followed by the CP point cost and a description of the action. Your army will be brought back to normal, set your status of the army by right clicking on the army and selecting the "normal" menu option. Your army will be brought back to Defeated. Set your status of the army by right clicking on the army and selecting the "defeated" menu option when the second CP is spent. 1: You failed, your enemy will start with ONE MORE CP in the next Generate CP's Phase. 2-3: You succeeded a bit, your enemy will start with ONE LESS CP in the next Generate CP's Phase. 4-5: You fooled them, use ONE CP OF YOUR ENEMY to move one of HIS armies as you desire. 6: You failed horribly, the next battle against this enemy, your enemy may choose one of your heroes which you must remove from the battle. You can spend one CP to move an army from one territory to another. You must make a MD roll. If you fail your MD roll the CP point is lost and the army stays where it is. If you move into a territory where an enemy army is present, the territory is captured by an enemy or has a DV > 0 you may not move any further until this territory is captured. A broken or defeated army may not move until it is rebuild. a) Having an army in an unclaimed(Owner flag is normal) or undefended (DV=0) terrain. b) Having reduced the DV of a claimed(Owner flag from enemy) or defended(DV>0) territory to 0.
c) Having won a battle against an enemy also present in this territory (even if defended). The scenario played depend on the terrain the battle takes place. For broken/defeated armies the scenario is always Last Stand. To capture it right click on the flag and select your army from the menu options. The Player loosing the battle must withdraw his army which counts as defeated (right click and set the status defeated). To retreat the army must move on the shortest possible may to an unoccupied or own territory. It must make a MD roll to reach the territory, if this is failed the army counts as broken (set status by rigt click on army and choose broken from the menu). A broken/defeated army loosing a battle is removed from play. A broken/defeated army winning the battle is immediately brought back to normal state. If an army cannot retreat to an unoccupied/own territory it is also removed from play, even on a draw. If the battle result is a draw, the player who moved into this terrain must retreat but the army retreating does not count as defeated. If it fails its MD roll it counts as defeated. You may deploy one more Hero choise than normal in your army if you pay the point cost. The points can only be spent on a wizard, magic points may not be spent for dispell scrolls. You can buy any monstrous mounts in your army for half the points cost. The catch: the model riding the monster must pass a LD test each turn and if failed roll on the monster reaction table. For each mining village under your control you can upgrade one core unit. You can choose one non magical weapon/armour upgrade for one unit for free. If the territory is not captured the army may not move any further in this turn. On rebuild of armies present in this territory roll a D6, on a 5+ the rebuild was a FREE REBUILD, no CP spent. If the territory is not captured the army may not move any further in this turn. On rebuild of armies present in this territory roll a D6, on a 3+ the rebuild was a FREE REBUILD, no CP spent. If the territory is not captured and no enemy is present and you move on roll a D6 on 3+ no CP is spent, the move is treated as a FREE MOVE. You have to roll for March Difficulty as normal though. If the territory is not captured and no enemy is present and you move on roll a D6 on 2+ no CP is spent, the move is treated as a FREE MOVE. You have to roll for March Difficulty as normal though. 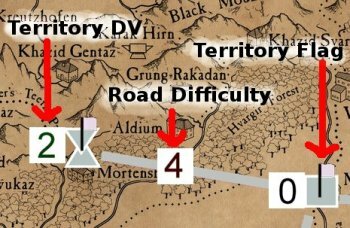 If the territory is not captured and no enemy is present and you move on roll a D6 on 4+ no CP is spent, the move is treated as a FREE MOVE. You have to roll for March Difficulty as normal though. Two allied armies are allowed in this territory. At start of turn in the generate CP phase roll a D6 for each Market Town. On a 6 add 1 CP to your starting CP total. Two allied armies are allowed in this territory. At start of turn in the generate CP phase roll a D6 for each Large Town. On a 5+ add 1 CP to your starting CP total. Two allied armies are allowed in this territory. At start of turn in the generate CP phase roll a D6 for each Large Town. On a 4+ add 1 CP to your starting CP total.